That tactic certainly avoids the marketing people having to coax some off-the-peg platitudes out of the CEO and (assuming they can talk their own clients into doing it too) I expect it to be copied by others. There is a dedicated page with more detail about the release in addition to the press material. 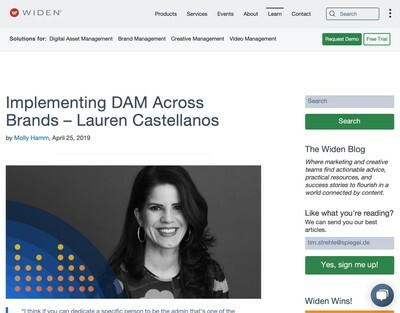 In common with some others recently, these have screen grabs and a brief outline of the new functionality, which is more useful and hopefully this approach is going to be adopted by more DAM vendors now. Having got the critique of their PR out of the way, what’s new? The highlight appears to be the dashboard feature referred to above and various methods for configuration of summary reporting functionality on a single page (using drag & drop ‘widgets’ etc which most readers will be familiar with). Although we have been fairly dubious about mobile DAM in the past on DAM News, I can see how this type of feature might be handy in a mobile context as many of the management personnel who need this kind of summary information are likely to be in meetings when the subject crops up, rather than sat at a desk searching for, or cataloguing, digital assets. I don’t know if On Brand has the same tablet support that Telescope does (North Plains’ own original DAM application) but that would be a point worth checking. Perhaps summary reporting is one of the use-cases which can be added to the (fairly short) list of real problems that mobile DAM can help solve, along with in-the-field asset capture. 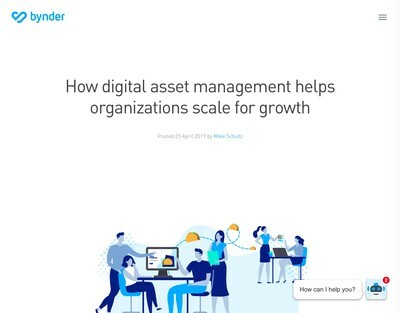 Obviously, the execution of these features is of equal or greater importance to simply being able to tick a box to say a given element is present in the application, but the pace of innovation in Digital Asset Management appears to have reached a plateaux currently and it is still not clear what might kick start it again. Although I have a few ideas myself and I would guess that a lot of end users do too. North Plains have another feature in On Brand 2.7 they call ‘Social Media Tracking’. 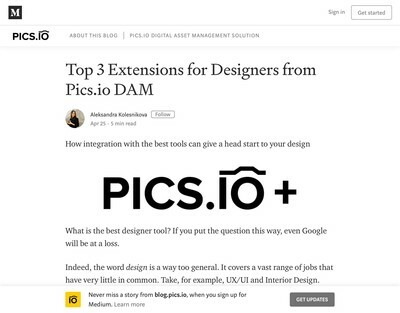 In December 2012, their head of marketing, Eric Courville, was writing some good articles about DAM and social media. I have also examined this topic in our discussion of the DAM Value Chain and Social Media last year. When I read the title of this element, what I was expecting was something specific to digital assets which allows IP owners to track usage of their media across social media channels. Reading the feature description a bit more, it gives the impression that it is more a general purpose social media monitoring tool that can filter through Twitter streams etc for keywords. I am not sure if I have accurately reflected the functionality offered, but this seems like a missed opportunity, for DAM at least. My guess is that many end users already employ other dedicated tools for monitoring social media so they get alerts when brands they are interested in are mentioned. You can do the basics of this already with just Google Alerts (albeit in a very simplistic fashion). Although North Plains might be trying to position On Brand as the ‘one stop shop’ for brand management, in reality most users will be more interested in its DAM-related capabilities as that is what they were originally interested in when they first licensed the product. I am sure they would counter-argue that their users are telling them they are interested in social media and probably the aforementioned managers would like something they can glance over on their tablets or smartphones. But I don’t think they are necessarily telling them the whole story – as is always the risk with listening exclusively to only the words your customers are using. Proprietary image tracking solutions from ancillary vendors like Digimarc etc. These are imperfect since all of them can be circumnavigated to greater or lesser degrees and for embedded metadata, a problem is social media platforms stripping it out upon upload. A non-trivial issue is the processing required to track image assets at any kind of scale. The cost of some of the options described is not always cost-effective to implement either, at present. The same could be said for many previous innovations in the Digital Asset Management market, however. Many features taken for granted now were once regarded as being demanding or complex (on-line video previews would be a relatively recent example). Taking a simpler and less sophisticated route towards social media tracking, just having dedicated URLs where users are required to specify where they want to post assets would be a start. When I read about DAM and social media, I get the sense that many will fall over themselves to use the buzzword ‘social media’, but are rather less keen to offer practical solutions – whether real or merely conceptual. I would be interested in software that has this capability as it should be firmly on the agenda now that social media is a mainstream outlet. The wider point is that the DAM solutions market appears to either be running out of ideas, or, the developers have walled themselves in with applications that have got too big and complicated to maintain while still sustaining the level of innovation that was attained about 4-5 years ago. 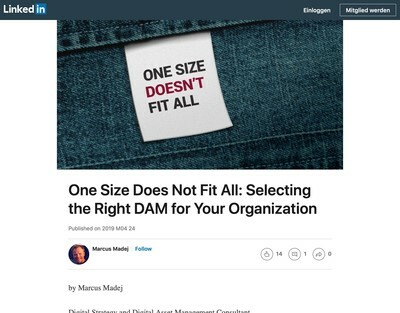 The approach taken by some is to horizontally integrate and rather than building more versatile and powerful systems that are focussed on DAM, specifically, they are expanding into adjacent fields instead to avoid having to cause any major upheaval to their current platforms. This might be our collective undoing (as an industry) because end users need to be able to properly understand what exactly they are being asked to invest their time and money into – suites are usually a harder sell and that is one reason for their higher price tags. On the other hand, it could be an opportunity for more innovative vendors to enter the market to fill the gap (possibly in collaboration with incumbent DAM solutions). It will be interesting to see how this plays out and what the consequences are for those who go down either route.